in my eyes I do have a strange behaviour: Temperature of Bed and Hotend are normal after starting the printer. I can heat up as usual without any problems. 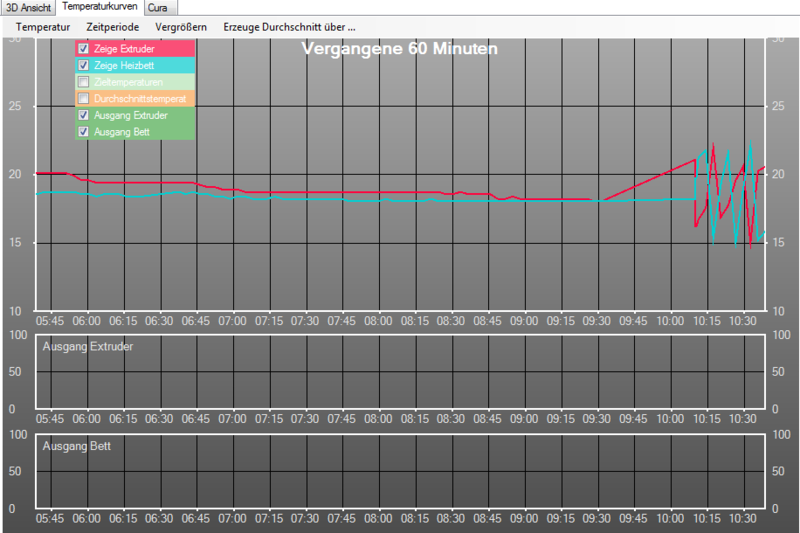 Temprature is stable within 0.1 K. When I than do homing (in the graph at 6:30) nothing special happens to T. At 7:30 I have moved x,y in a wide range (350 mm). Nothing spcial. At 8:00 I have moved z up and down. Nothing special. At 9:30 I started the auto bed levelling (servo with switch attached, scans with three points the bed). As soon as the auto bed levelling is finished, the temperature becomes instable as seen at 10:15. Looks like an oscillation, not noise. T(bed) and T(nozzle) are always phase shifted by 180°, so when T(bed) goes up, T(nozzle) goes down. This is highly reproducible. It always appears after the bed levelling. I do use Repetier firmware 0.93 on a Rumba board (version with melting fuse of a car) with display attached. I tried to switch to 1.0, but than the machine resets after each auto bed levelling. I control the machine via repetier-firmware 1.6.2 without using the sd-card, so in direct communication. There was a warning when compiling the firmware, that there is less memory, so it may be instable. Could this be the reason? I have no idea what I can remove to clean up some memory. There is only one language installed, no additional motors or so, no second extruder. My printer: an old milling machine, Iselt, xyz coordinates, using trinamic steprocker in step/dir mode as x-y-driver with their own power supply; z and extruder are controlled via standard drivers. Has anyone an idea what to try? Thanks for your time! I found out: If I disconnect the servo, I do not have the oscillations. The oscillations depend on the value of the servo. M340 P0 S2265 produces high oscillations (but only after bed levelling!). M340 P0 S1865 produces nearly no oscillations. Still there is the question: Why does it appear only after auto bed levelling? That's why I thought it is a bug. Maybe it is the wrong catgory, sorry. Does the servo have a separate power source? Otherwise it might just draw to much ampere from the 5V arduino power. That power is very limited and normally not enough for a servo. No, it has not. Could this explain, why it occurs only after the Auto bed levelling? Position of servo is the same before and after auto bed levelling. Before servo was off, afterwards it is holding position with force. - M340 P<servoId> S<pulseInUS> R<autoOffIn ms>: servoID = 0..3, Servos are controlled by a pulse with normally between 500 and 2500 with 1500ms in center position. 0 turns servo off. R allows automatic disabling after a while. Add R300 to auto turn off after 0.3s so it does not draw any current. Thank you very much, that solved the problem! I tried 1.0: Still the machine resets after auto bed levelling. I disconnected the servo in version 1: still it hangs up, but this is another problem for another topic. How do I close a threat? Nut sure if you can. I have a gear icon at the top of the thread to close it, but I'm also admin.